Authors: Amin, M. A., Bashar, M. A., Akhter, N., Afroj, M., Islam, M. Z., Rahman, M. M. & Baque, M. A.
Abstract: The main focus of the study was to determine constraints faced by the farmers in IPM practices in rice cultivation, and to explore the relationship between the constraints faced by the farmers in IPM practices and their selected characteristics. The study was conducted at Ratanpur and Sreeampur union of Nabinagar upazila under Brahamanbaria district. Data were collected from 107 rice farmers who were randomly selected as the sample of the study from an update list of 1534 rice farmers that was prepared with the help of Sub-Assistant Agriculture Officers (SAAOs) of the study area. The researcher collected data through personal contact with a well structural pretested interview schedule. The study revealed that the highest proportion (75.70 percent) of the respondents faced medium constraints in IPM practices, while the17.76 percent of the respondents confronted high constraints and the rest 6.54 percent of respondents faced low constraints in IPM Practices. Pearson’s product moment correlation Co-efficient (r) was computed to explore the relationship between the constraints faced by the farmers in IPM practices and their ten selected characteristics. The correlation analysis stated that education, training received in IMP practices, extension media contract of the farmers had negative relationships with their constraints faced in IPM practices whereas age, total family members, rice cultivation area, annual family income and agricultural experience had no significant relationships with the constraints faced in IPM practices in rice cultivation. Amin, M. A., Bashar, M. A., Akhter, N., Afroj, M., Islam, M. Z., Rahman, M. M. & Baque, M. A. (2016). Constraints faced by the farmers in IPM practices in rice cultivation. 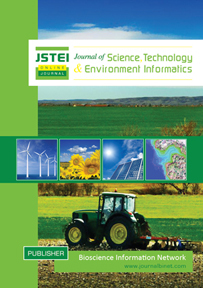 Journal of Science, Technology and Environment Informatics, 04(01), 245-250. Amin, M. A., Bashar, M. A., Akhter, N., Afroj, M., Islam, M. Z., Rahman, M. M., Baque, M. A. “Constraints faced by the farmers in IPM practices in rice cultivation.” Journal of Science, Technology and Environment Informatics, 04.01 (2016): 245-250. Amin, M. A., Bashar, M. A., Akhter, N., Afroj, M., Islam, M. Z., Rahman, M. M. & Baque, M. A. Constraints faced by the farmers in IPM practices in rice cultivation. Journal of Science, Technology and Environment Informatics, 04, no. 01 (2016): 245-250. Authors: Riza, A. N., Akhter, T., Akhter, F. & Khair, M. A.
Abstract: A study was undertaken to evaluate the low-head drip irrigation system introduced by ARFA Engineering in Bangladesh. The experiment was conducted at the Hydraulic Laboratory in the Department of Irrigation and Water Management, Bangladesh Agriculture University, Mymensingh. A timber framework (10.2 m long) experimental layout was assembled to support the drip lines at various land slopes (0 to 3.03%). Drip lines were positioned along the timber framework. A mini tank was used as water source and was placed at varying heads (0.5-1.0 m) from which water was allowed to flow through the rubber pipes at different emitters along the lateral lines. To collect the emitter water, catch cans were placed along the drip line directly below the emitters. Data were collected at varying water head, land slope, lateral length. Varying water head, land slope and lateral length affected the result. The experiment showed that for different heads and slopes, EU values are < 70% and FV values >20% and a CV value > 0.15 indicating that the performances of this (ARFA) drip irrigation system is very poor and not acceptable to irrigate crops in the field. Riza, A. N., Akhter, T., Akhter, F. & Khair, M. A. (2016). Evaluation and improvement of a low-head drip irrigation system to be used by small scale farmers in Bangladesh. Journal of Science, Technology and Environment Informatics, 04(01), 251-259. Riza, A. N., Akhter, T., Akhter, F. & Khair, M. A. “Evaluation and improvement of a low-head drip irrigation system to be used by small scale farmers in Bangladesh.” Journal of Science, Technology and Environment Informatics, 04.01 (2016): 251-259. Riza, A. N., Akhter, T., Akhter, F. & Khair, M. A. Evaluation and improvement of a low-head drip irrigation system to be used by small scale farmers in Bangladesh. Journal of Science, Technology and Environment Informatics, 04, no. 01 (2016): 251-259. Authors: Khan, M. A. S., Waliullah, M., Hossain, M., Mandal, B. H., Habiba, U. & Siddique, M. N. A.
Abstract: A trace level of arsenic in drinking water is toxic for human body. Ground water arsenic contamination is well known in the world. Arsenic in ground water is a serious health threat in arsenic contaminated areas. Last 20 years, many arsenic mitigation projects have been implemented at arsenic prone areas of Bangladesh. This study investigated the present status of existing integrated arsenic mitigation projects activities. Study was conducted on three village of Jessore district in Bangladesh where more than seven thousand people have been facing arsenic contamination problems in ground water. A total of 600 samples were collected following household survey method. Analysis suggested that slightly over half of the respondents are educated and nearly 42% was engaged withagriculture.41% and 37% people were known about arsenic and arsenicosis. Arsenic safe, arsenic contaminated and not tested tube wells were 51%, 23% and 26% respectively. It was found that 52% and 46% people were using arsenic safe water from deep tubewell and shallow tubewell which was installed by GOs and NGOs. But it was found that 2% people were still using arsenic contaminated tubewell water. This study found that 70% and 35% people were interested to pay their user share for safe water device installation and its maintenance purpose. People of arsenic prone areas were changing their habit to use arsenic safe water from deep tubewell for saving their lives from arsenicosis diseases. Arsenic mitigation programme motivated arsenic affected people increased their knowledge; hence changed drinking water use practice. Furthermore, this study found that community participation was not enough for safe water system maintenance. But vulnerable areas of arsenic affected people solved their arsenic problem by using arsenic safe water sources and its maintenance by user participation. Arsenic mitigation project activities were given a great benefit for awareness building and sustainable safe water supply. Khan, M. A. S., Waliullah, M., Hossain, M., Mandal, B. H., Habiba, U. & Siddique, M. N. A. (2016). Safe water access, motivation and community participation at arsenic affected rural areas of Jessore, Bangladesh: insights and realism. Journal of Science, Technology and Environment Informatics, 04(01), 260-269. Khan, M. A. S., Waliullah, M., Hossain, M., Mandal, B. H., Habiba, U. & Siddique, M. N. A. “Safe water access, motivation and community participation at arsenic affected rural areas of Jessore, Bangladesh: insights and realism.” Journal of Science, Technology and Environment Informatics, 04.01 (2016): 260-269. Khan, M. A. S., Waliullah, M., Hossain, M., Mandal, B. H., Habiba, U. & Siddique, M. N. A. Safe water access, motivation and community participation at arsenic affected rural areas of Jessore, Bangladesh: insights and realism. Journal of Science, Technology and Environment Informatics, 04, no. 01 (2016): 260-269. Authors: Rabbani, M. A., Hossain, M. M., Asha, J. F. & Khan, N. A.
Abstract: Maize cultivation gets popularity now-a-days in Bangladesh because of multifarious use of maize as human food and especially in the poultry industries. Maize is cultivated manually which is time consuming, labor intensive and costly. A low cost manually operated push type maize planter was designed, developed and tested in the testing bed of the department of Farm Power and Machinery, Bangladesh Agricultural University, Mymensingh which reduces these problems. The maize planter consists of two runner wheels, a seed hopper, an inclined plate type seed metering device, a seed tube, a pair of bed former and handle. Power is transmitted from the runner wheel to the metering device through bevel gear mechanism. UniGreen (NK-41) hybrid maize seeds were used to test the planter. The planter was calibrated in the lab to maintain the desired seed rate of 25-30 kg/ha. In the laboratory test, the effective field capacity, field efficiency, average distance of dropped seed, plant population and missing rate were found as 0.128 ha/hr, 76.5%, 22.5 cm, 8 plants/m2,and 13.43% respectively for first maize planter. The operational cost of the first maize planter was achieved as 410 Tk/ha whereas in manual planting of maize it is 5250 Tk/ha, thus the planter may save about 92% cost for maize establishment. The pushing force of the maize planter was 90 N, which is quiet low to operate by a female person. The machine might be acceptable since it is easy to operate, simple in design and mechanism, light in weight, requires less labor and cost of planting after further trial in the farmer’s field. Rabbani, M. A., Hossain, M. M., Asha, J. F. & Khan, N. A. (2016). Design and development of a low cost planter for maize establishment. Journal of Science, Technology and Environment Informatics, 04(01), 270-279. Rabbani, M. A., Hossain, M. M., Asha, J. F. & Khan, N. A. “Design and development of a low cost planter for maize establishment.” Journal of Science, Technology and Environment Informatics, 04.01 (2016): 270-279. Rabbani, M. A., Hossain, M. M., Asha, J. F. & Khan, N. A. Design and development of a low cost planter for maize establishment. Journal of Science, Technology and Environment Informatics, 04, no. 01 (2016): 270-279. Authors: Atikpakpa, A. A., Okafor, C. E. & Okonkwo, U. C.
Authors: Khatun, M. U. S., Alam, M. A. U., Hossain, M. A., Islam. M. K., Anwar, M. M. & Haque, M. E.
Abstract: The study was conducted to determine the yield and economic consequences of two cropping patterns viz. improved cropping pattern (Radish-Potato/Maize-T. Aman rice) and farmers’ pattern (Potato/Maize-T. Aman rice) through incorporation of modern high yielding varieties and improved management practices for crop production. The experiment was laid out in randomized complete block design with six dispersed replications in farmers’ field condition in Domar, Nilphamari in three consecutive years 2009-12. Three years mean data showed that the improved management practices for the pattern provided significantly higher yield in improved pattern. The gross return (Tk. 4,32,990/ha) and net return (Tk. 1,98,324/ha) of improved pattern were 33.56 % and 24.93 % higher, respectively compared to that of farmers’ pattern with 45.44% extra cost. The higher marginal benefit cost ratio, land use efficiency and production efficiency indicated the superiority of the improved pattern over the farmers’ practices. Khatun, M. U. S., Alam, M. A. U., Hossain, M. A., Islam. M. K., Anwar, M. M. & Haque, M. E. (2016). Evaluation of production potential and economics of Radish-Potato/Maize-T. Aman cropping pattern in Rangpur region. Journal of Science, Technology and Environment Informatics, 04(02), 293-300. Khatun, M. U. S., Alam, M. A. U., Hossain, M. A., Islam. M. K., Anwar, M. M. & Haque, M. E. “Evaluation of production potential and economics of Radish-Potato/Maize-T. Aman cropping pattern in Rangpur region.” Journal of Science, Technology and Environment Informatics, 04.02 (2016): 293-300. Khatun, M. U. S., Alam, M. A. U., Hossain, M. A., Islam. M. K., Anwar, M. M. & Haque, M. E. Evaluation of production potential and economics of Radish-Potato/Maize-T. Aman cropping pattern in Rangpur region. Journal of Science, Technology and Environment Informatics, 04, no. 02 (2016): 293-300. Authors: Nahar, M. A., Begum, S., Rabbani, M. G. & Karim, M. R.
Authors: Haldar, P. K., Saha, S. K., Ahmed, M. F. and Islam, S. N.
Abstract: Crop production and livelihood practices in coastal communities of Bangladesh are seriously impacted by natural calamities, triggered by salinity intrusion, shrimp farming and drainage congestion. The study was conducted in three villages of Koyra upazilla under Khulna district in 2014 which were affected severely by cyclone Aila on 25th May 2009. The study explores the potential factors, local practices and coping strategies the rice farming communities experienced during livelihood recovery process after cyclone Aila. The study also measures how their adopted practices contribute to the production of rice in coastal areas. Total 96 rice farmers were interviewed with snowball sampling technique and 3 Focus Groups Discussion (FGD) were conducted with 29 farmers in study areas. The study reveals that at least 12 hazards always disturb coastal farmer to cultivate rice of which five hazards have impacts ranging medium to high level. Result shows that rice farmers have experienced at least 16 different adaptation practices for rice cultivation which play potential roles at different scales. The study also represents that different factors of production have positively influence Aman rice production, use of fertilizer influence rice production significantly at 5% level of significance. Study also tested that production of rice on alleviated land (high land) is 22% higher that the beel land. Most importantly it has shown the statistically significance of production performance for adopting different adaptation practices that influence rice production at 5% level of significance. So for the rice production along with the use of different inputs, different adaptation options have to be strategically furnished as community based practices. Besides, the study also reveals the importance of Government and private sectors initiatives to support rice farming communities for higher production through proper planning and technical support. Haldar, P. K., Saha, S. K., Ahmed, M. F. and Islam, S. N. (2017). Coping strategy for rice farming in Aila affected South-West region of Bangladesh. Journal of Science, Technology and Environment Informatics, 04(02), 313-326. Haldar, P. K., Saha, S. K., Ahmed, M. F. and Islam, S. N. “Coping strategy for rice farming in Aila affected South-West region of Bangladesh.” Journal of Science, Technology and Environment Informatics, 04.02 (2017): 313-326. Haldar, P. K., Saha, S. K., Ahmed, M. F. and Islam, S. N. Evaluation of production potential and economics of Radish-Potato/Maize-T. Aman cropping pattern in Rangpur region. Journal of Science, Technology and Environment Informatics, 04, no. 02 (2017): 313-326.